While some analysts have correctly noted that Trump may have a point, the probability of a group of career economists making decisions based on their “feel” of the market rather than data is slim indeed. Moreover, the President’s public lobbying of an ostensibly apolitical organization is more likely to backfire than to succeed, as the central bank will be loath to be seen as bowing to political pressure. With traders still pricing in an above-70% chance of a move from the Fed tomorrow, the central bank should feel comfortable raising rates. After all, the central bank most recently expected three more interest rate increases in 2019, creating a sharp divergence with traders, who are only expecting a 50/50 chance of a single rate hike next year. With a dovish hike already well priced into the market, how far the Fed’s 2019 projections come back toward the market will determine whether the greenback will be able to extend its current rally. A slight negative revision, with the median policymaker expecting two interest rate increases in 2019, appears to be the market’s base case at this point. Therefore, a sharp downward revision to just a single anticipated interest rate hike next year, would likely lead to weakness in the US dollar and a recovery in beaten-down US stocks. On the other hand, a steady median forecast for three rate rises in 2019 could boost the buck and lead to selling in stocks as traders price in tighter financial conditions. As we go to press, the US dollar is on the verge of a potential bearish breakdown. 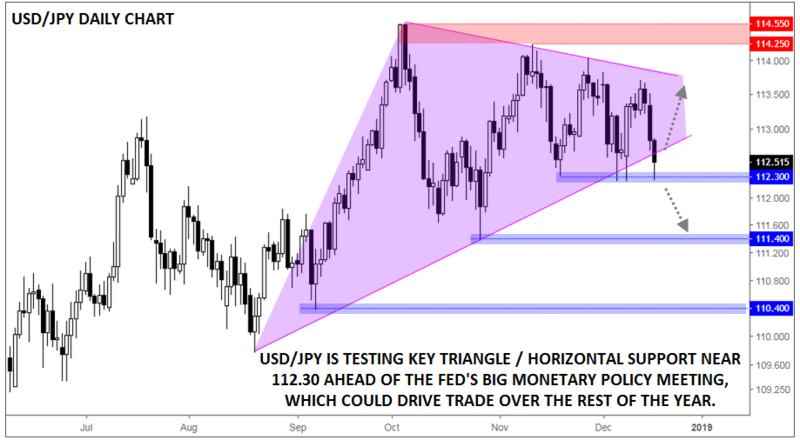 The pair is probing the bottom of its four-month symmetrical triangle pattern, in addition to recent horizontal support at 112.30. A break below there (potentially due to a more-dovish-than-anticipated Fed meeting) would open the door for a 100- or 200-pip drop toward the previous lows at 111.35 or 110.35 heading into the new year. Meanwhile, a more optimistic Fed could take USD/JPY back toward the top of its recent range in the lower- to mid-114.00s.